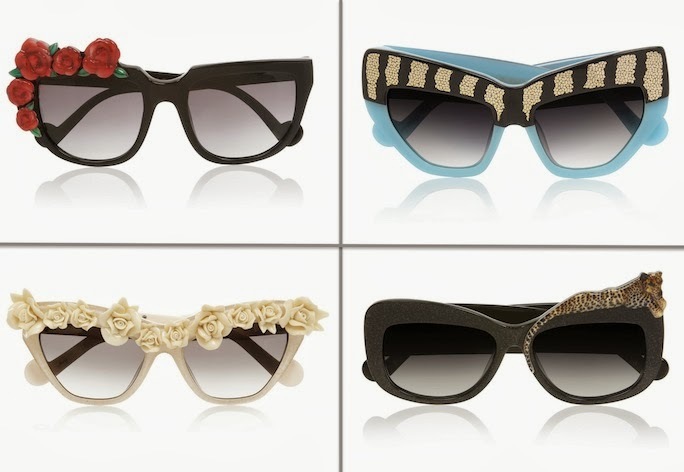 Anna-Karin Karlsson couture sunglasses are lending a whole new meaning to the term "crazy eyes". The Swedish designer's whimsical statement frames are fixtures among the fashion crowd and have graced the faces of fearless celebs including Lady Gaga and Rhi Rhi (both have the 'When Trouble Came To Town' style). Karlsson started her journey toward avant-garde eyewear elitism as a child when a friends mother returned from Florida equipped with '80s glamour accessories and she honed her skills in London. It's her combination of this outrageous glamour mixed with her deep love of music and couture craftsmanship that makes her accessories truly unique. Sure, $500 plus may be a lot to spend on shades, but who can resist glitter frames topped off with a lounging leopard or an ivory bed of roses? If the answer if you, then check out these more wallet friendly mirrored stunners by Super Sunglasses. I think these are gorgeous, but I'm not sure if my small face could pull them off! These are all so fun! I love the white flower ones!